It was inevitable that, in order to keep up with competitor DC’s femme freedom fighter Wonder Woman, Marvel would feature a female to headline one of their superhero films. That non-drug heroine is Carol Danvers (not to be confused with Kara Danvers of Supergirl fame), a.k.a. Captain Marvel (Brie Larson). A former Air Force pilot, Danvers is now an intergalactic fugitive who comes to Planet C-53 (some hellhole named Earth) to discover clues about her past. Danvers soon finds herself caught in the middle of a conflict between the Kree and the Skrulls, two warring alien races in search of a blue Rubik’s Cube called a Tesseract. To thwart this cosmic conspiracy, Danvers joins forces with S.H.I.E.L.D. agents Fury (Samuel L. Jackson) and Coulson (Clark Gregg). Marvel isn’t an amazing Marvel movie, but it’s a really good one. The writers spend ample time on character development, which is refreshing for a superhero movie. The plot coheres despite its many time jumps and manages to have a few genuinely surprising twists along the way. Also, the film’s well paced action sequences aren’t overblown like those in many Marvel movies. The way the writers gradually reveal Danvers’ origin story is extremely clever; as the Skrulls (who are somewhat reminiscent of the Goblins from LOTR), scan Danvers’ memories, looking for any hint of the Tesseract, we learn valuable insights into her upbringing and background. We gain firsthand knowledge of the Kree culture from when Danvers lived on their Coruscant-like planet and learned combat skills from expert trainer Yon-Rogg (Jude Law). Ben Mendelshon, who excels at playing heavies (Rogue One and Ready Player One) turns in a fairly nuanced performance as a Skrull infiltrator. Kree villain Ronan (Lee Pace), who met his timely demise in the first Guardians of the Galaxy (2014) film, only has a handful of scenes and, sadly, doesn’t significantly factor into the movie’s action. The CGI on Jackson and Gregg’s regressed visages is quite impressive—it’s amazing how today’s digital artists can remove 20-30 years with the click of a button. Gregg makes the most of his scant scenes as newbie agent Coulson and Jackson effectively provides the bulk of the movie’s comic relief. There’s also a nostalgia factor here. Typically, time travel movies go “back in time” to the 80s. Marvel takes us back in the 90s, which, with its boxy cars and Blockbuster Video stores, looks just as old as the 80s at this point…how time flies. 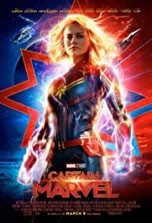 Suffice it to say, there’s a great deal of connective tissue between this film and the Marvel panoply, which is a formula the studio has refined to a science by now. So, will there be a Captain Marvel 2? If so, it will probably be set in the present (as was revealed during the first end credits clip). What are the main takeaways of the film? His friends call him Fury. Be double, triple sure you know who your enemies are. And always keep an eye on that darn cat.